Andrew Ganz November 20, 2018 Comment Now! On Isla Sorna, the fictional island setting for the “The Lost World: Jurassic Park,” dinosaurs vaulted millions of years into the future and chewed up camouflaged Mercedes-Benz M-Class SUVs. 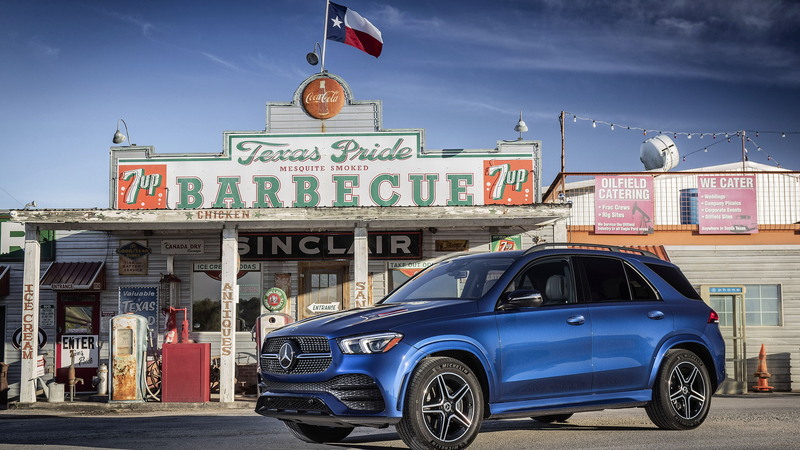 The 2020 Mercedes-Benz GLE I find myself hustling through empty ranch roads outside of San Antonio on a damp fall morning is certainly no dinosaur. It’s more jacked-up E-Class wagon than trucky mud-plugger, an image Mercedes once tried to cultivate for its mid-size crossover SUV. The quality-deficient original was far from perfect, but it put a tony, high-riding Mercedes SUV in showrooms well before Lexus, Audi, and BMW. I’m more convinced about Lesnick’s confidence when it comes to the GLE. This highly evolved crossover takes the E-Class sedan’s absorbent suspension and luxurious interior and elevates them, both figuratively and literally. 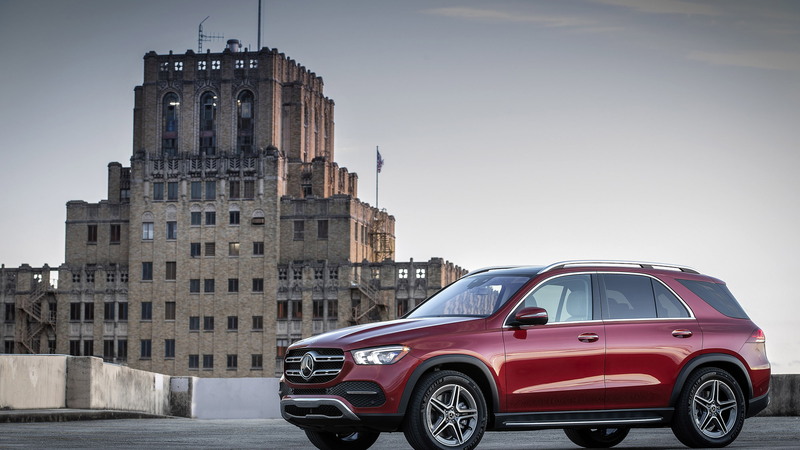 Mercedes hasn’t announced pricing for the 2020 GLE, but it’s hard to imagine one costing less than $60,000 by the time the first models hit dealer lots next spring. 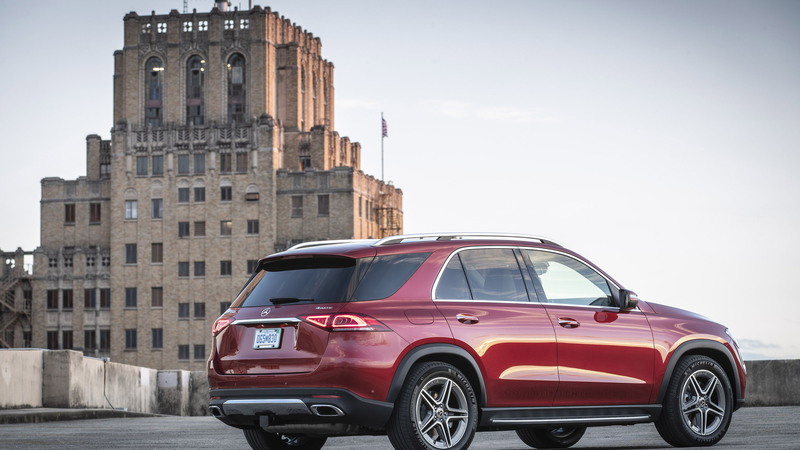 The GLE will hit the road initially in GLE350 and GLE450 configurations, with numbers attached to their swoopy tailgates that have nothing to do with their 255-horsepower 2.0-liter turbo-4 and 362-hp 3.0-liter turbocharged inline-6 engines. Either is capable of outgunning a stegosaurus, although the 350’s motor runs out of grunt for comfortable high-speed highway passing. In both, a 9-speed automatic transmission shuttles power to all four wheels. A rear-drive GLE350 for sun belters will follow next summer. The transmission matches best to the 450. The 350 occasionally fumbles between gears at lower speeds. In Sport mode accessed via a dainty rocker switch, Mercedes pipes in reasonably convincing sporty rumble, but the engines are otherwise muffled so well that tire and wind noise are the biggest aural offenders. The GLE450’s turbocharged inline-6 is paired to a 48-volt mild hybrid system that adds power and should save fuel. EPA fuel-economy ratings aren’t yet available, but the trip computer said that my test car averaged nearly 30 mpg in mixed driving. A similar drive in a GLE350 returned roughly the same number. Where the GLE makes its biggest strides is in the way its new air suspension gobbles up bumpy roads. A coil springs suspension is standard on the GLE350, but the only models Mercedes had on offer were fitted with the air springs. The 48-volt mild-hybrid system can operate an optional hydropneumatic suspension that works in tandem with the myriad active safety sensors to scan the road ahead for imperfections and prepare the suspension to handle them. Additionally, it’s said to quell body lean in tight corners. I didn’t get the chance to experience what will undoubtedly be a costly optional extra reserved for the GLE450, but even the conventional air suspension is exceptionally well controlled. Flicking an air-suspension GLE into Sport mode firms up the ride, though we’ll have to wait for the inevitable AMG-tweaked variants before any GLE is truly entertaining. 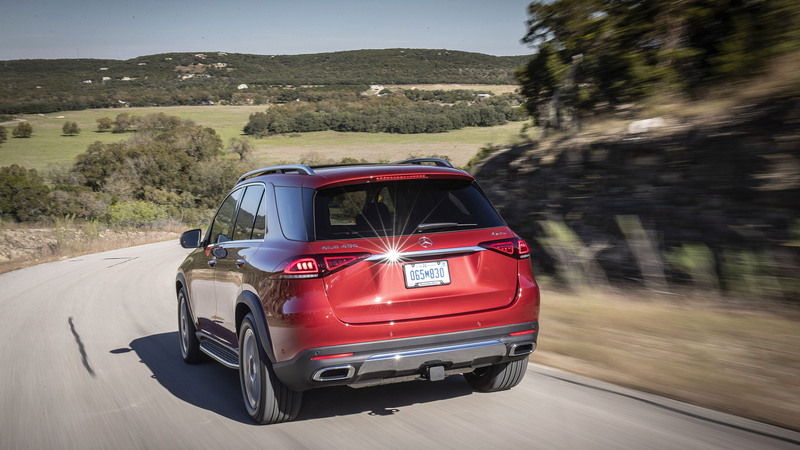 The air suspension can be raised at the tap of a switch for more ground clearance. 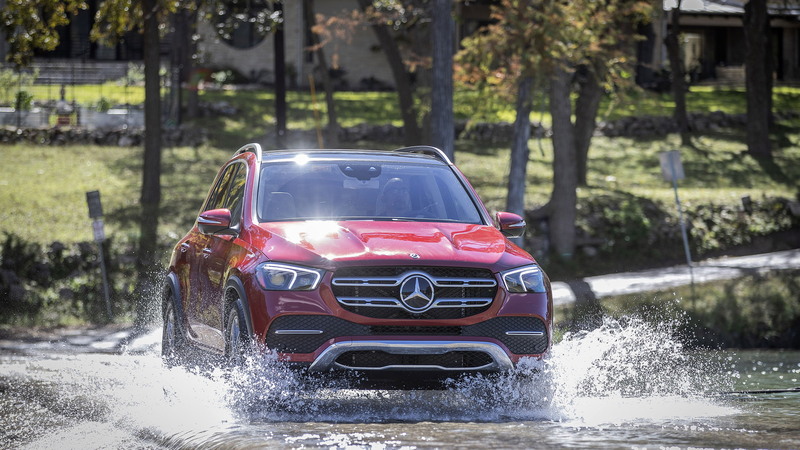 GLE crossover SUVs with the hydropneumatic suspension can rock themselves out of a sand dune on a Nantucket beach or in the Arabian desert—or pop and lock on a hotel valet court. Inside, the GLE features the swoopy E-Class dash but has some different details, such as the square climate control vents. Base GLEs are swathed in synthetic leather. Lighter hues brighten the interior and pair well with the available matte-finish wood trim and the user-configurable ambient lighting. The AMG design package that paints the fender flares to match the body also adds a black headliner that makes this spacious interior feel confining. On higher-trim GLEs, a pair of 12.3-inch widescreen displays sit under a single pane of glass. One serves as the instrument cluster, while the other is a touchscreen that runs Mercedes’ new MBUX infotainment system. It may read like a tech stock, but MBUX is less volatile. It’s flashy, with bright graphics and myriad hidden menus. It’d be nice to see certain features—think lumbar support and optional massaging for the seats—repeated with conventional buttons on the seat’s sides. The laptop computer-like MBUX touchpad makes controlling the system relatively easy, although a tuning knob would be a welcome addition. The touchscreen gets very hot after a few minutes and it’s mounted too far away to easily reach while driving. Apple CarPlay and Android Auto are standard, but still require users to plug in their phones unlike BMW’s wireless system. The GLE’s dashboard is high and its hoodline dives low, so it doesn’t have the commanding view of the road ahead of a Range Rover Sport or even a BMW X5. Over-the-shoulder vision is obstructed by the tiny rearmost side windows and the massive C-pillar inherited from the ML320. A nifty trick is a forward-facing camera that transmits a live image of the view ahead to the infotainment screen when the turn signal is flicked on. You could miss an approaching raptor in its blind spot, but that’s true for most crossover SUVs. A third-row seat is a new option, returning to Mercedes’ mid-size model for the first time since a pair of glorified camp chairs were bolted into the M-Class. Most shoppers eager to seat more than five adults will wait for the next GLS, which is essentially a long-wheelbase version of the GLE. Perhaps that’ll be the one that gets fitted with bars to keep overgrown lizards at bay.